Will you see the extensions? or will people be able to tell i have them? Answer: As you can see from the image below Great Lengths is a Seamless Blend..... there is a seamless blend between your hair and the extensions of course this all depends on your natural hair and what we are working with,the application and a professional hair cut are very important to the end results. 1. Have you ever desired longer, thicker hair? 2. Have you tried to grow your hair and your just not seeing the result you wish for? 3. Have you gotten a hair cut that was too short or too layered, your just not happy with? 4. Are you looking to get volume in your hair? 5. Have you gone through any major changes which have affected your hair's growth and your just not happy with your hair? * if you have answered yes to any of these, you are a canadiate for Great Lengths Hair Extensions. What does that mean, density of your hair, and attachment size? Answer: The denisty of your hair means the thickness of each indivudal hair strand ,you may have coarse hair, or fine hair, that will be determined on your consultation, According to your hair type the bonds are customly measured to match the denisty of your hair. when the right size attachment is attached, there will be no damage or stress to your own hair. How does the hair stay in? Answer: Great Lengths has a unique design that is Patent, its called the Patent Palalmer Protein Complex which is the bond, The bonds are a exact copy of the interiror structure of your own hair, which makes a perfect match, when using thermal fushion, the bond is broken down from its original state, and modulated onto your hair strand, becoming one with your own hair. What Lengths do the hair come in? and are their length restrictions for each individual? Answer: Great Lengths comes in several different lengths, whats so amazing about the hair is that whatever length is chosen on your consultation, it is dense from the bond to the end, giving you the full length desired.. The Lengths are 8 inch, 12 inch, 16 inch, 18 inch, 20 inch, and 24 inch. There are length restrictions, according to the density of your hair, and the length you already have, is how the length you can go is determined. The longer the hair the more weight it has on your natural hair. 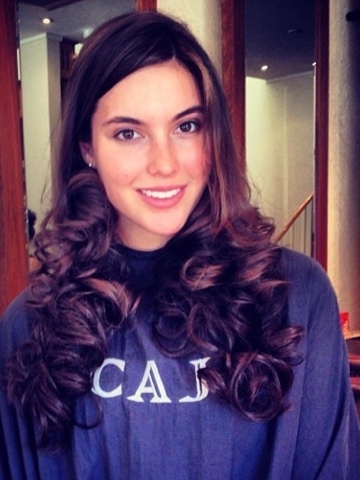 What is the price of Great Lengths Extensions? What is the maintence of the Great Lengths Extensions? Answer: The maintence is actually simple, After application you wash your hair after 48 hours to allow the bonds to settle, brushing 2/3 times a day, using the appriopriate shampoo and conditioner, drying the bonds after the shower,not applying heat tools to bonds, not pulling hair,having monthly cheques to ensure there is no noting,and avoiding oils of any sort as they can cause slipping of extension,this will all be explained with more information at the time of the consultation. What is the process the day of the application? Answer: The consultation is always first, so we can meet, discuss your goals, offer a plan of action, pick colors and length and talk about Great Lengths, after the appiontment is booked, the client will come into the salon have her hair clarifyed and prepped. A hair trim is done on the natural hair to ensure it stays healthy, the application of the Great Lengths Extensions, and then a Professional hair cut with layers and texturizing and a style is done to complete the process. Everything is done for you in the salon. * If you are wearing a current extension and they need to be removed, this is also done for you prior to clarafying.